The Path You Take: Don't just stand there! How are you *actually* supposed to stand? You have a really clear way of explaining things. This is something I've been trying to work on for some time and I thought I knew what I was doing, but whenever I read your blog, you put things in a way that gives me that extra bit of understanding. Thanks Meredith! I'm so glad you find it helpful! I find myself violently agreeing with your observations about standing posture. 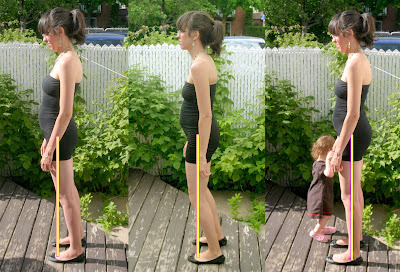 Our standing/walking posture must be able to have give in any direction to deal with irregularities in the surface. Excessive tension in our foot muscles will make it much more likely for those irregularities to throw us out of balance. 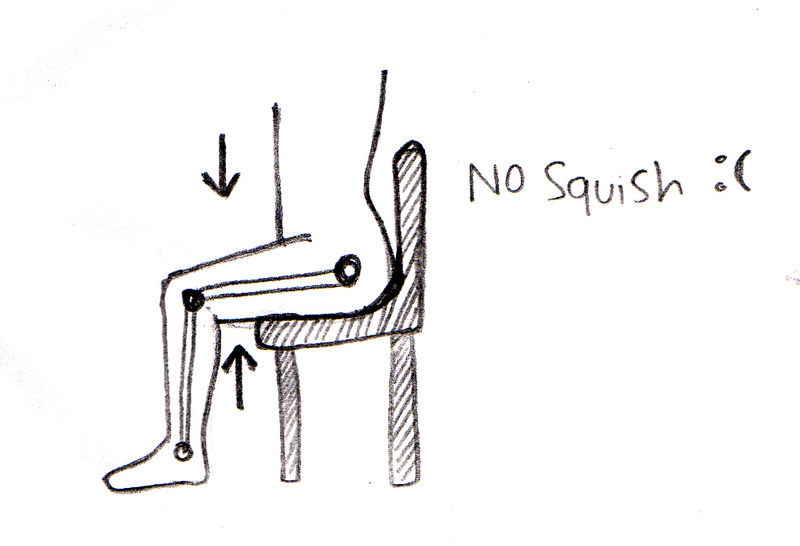 The best cue I give myself is to keep my foot in the "sweet spot" as I'm moving. I'm a little less happy with the claim that rotation forces (AKA torque) are bad for bones. As a practical matter, there's only a tiny instant during the middle of the stride where the femur is directly over the tibia and both are normal to the ground. Small torsional forces will always be present as we walk. I might be willing to say that those torsional forces should be minimized, but I want to think about this some more. You have an excellent common-sense writing style. Cool. As for the walking bit, the most important time for the leg to be as vertical as possible is on the heel strike so that the torque is not maximized during that moment. When your heels strikes the ground, the load is increased momentarily. So the 100lbs turns into say 115lbs (random number, i don't know the actual math behind it). 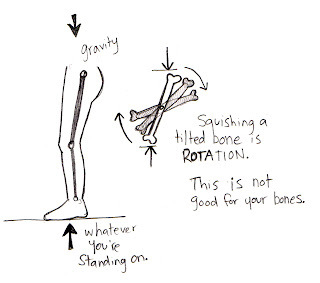 Putting the extra weight on a tilted bone creates excessive rotation. 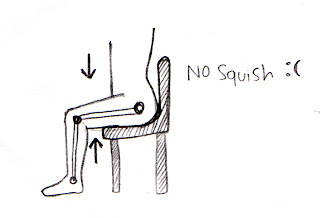 If your leg is vertical on the strike, you get squish instead of rotation. 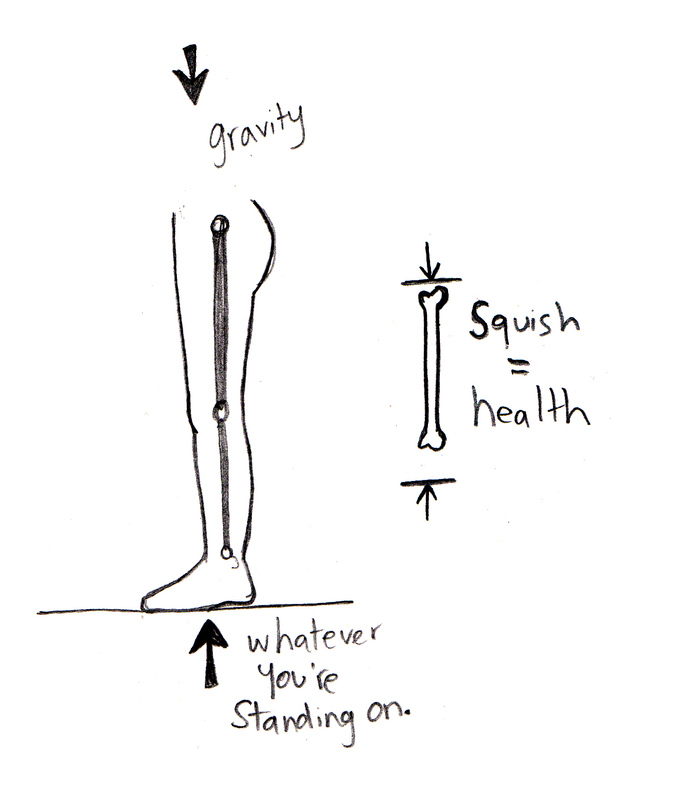 If you walk with your leg way out in front of you and you fall onto it, you're getting rotation instead of squish :)Of course, at some point in the gait cycle the bone has to tilt (rotate at the hip). Otherwise we'd be doing some kind of robot shuffle in one spot. Would look silly! Hi, Jillian. I found your site through a share on FB today. I haven't looked around any yet, but will do that in the next day or two. I'm a huge fan (and friend) of Stephen Levin at biotensegrity.com. Levin notes (and I agree) that a "levers and pivots" model is fundamentally insufficient to describe our posture and movement. 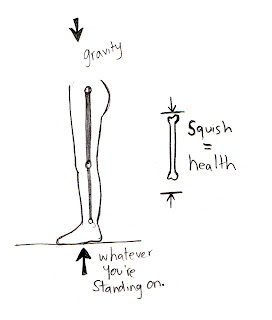 We have lever arms, but there are never (rigid) fulcrums anywhere in the body. I need to look very closely, but I see nothing you're saying that's inconsistent with Dr. Levin's ideas. You have good ideas, and you explain them very well. That's what we need to advance our understanding as a society. She's incredible! Looks at the human body from an engineering, physics, geometry, and biological perspective. It's so refreshing and new. here's her institute page where I'm gonna be certifying in a month!! also? my 9-year-old daughter and i just spent 15 minutes playing with your pictures and trying them. she says, i feel totally unstable if i let my bones spin around! hee! That is so cool!! you gotta give your daughter a big fat high five from me. :) Thanks for the tips about handstands. I can't actually do one *L* my hands are too tight!